Holy cow, I actually "beat" a game today. My daughter and I decided some time ago we would like to kill the Ender Dragon in Minecraft. 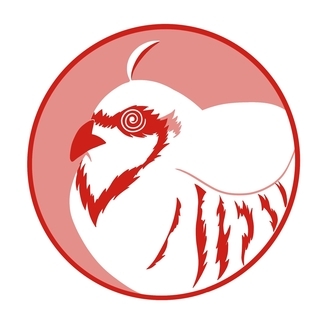 Unfortunately we found in our main world that we could not find a the End Portal, so we decided to make a new world together with the sole purpose of working towards the End. This was a couple of months ago now, as we only played a little bit at a time, and as of this morning we were ready for the final battle. The battle didn't go all that well for my daughter, she died and had to respawn about 4 times, while I chipped away at the dragon's life bar. When it was down to about 10% the game was lagging badly and I managed to die as well. As I was running back to the portal my daughter scored the final blow and we had reached our goal. MInecraft is a wonderful game with the capacity to eat up huge chunks of your life without you even noticing. I enjoy playing it with my kids and watching them play it together. The ending isn't much of a payoff, though it does open a new area to explore, so I imagine we will return to this particular world to check out what is new. Oh man i loved to read your experience with minecraft, my daughter loves the game but she only plays in creative mode now, amazing story! Yeah that's awesome. I mostly play in creative mode myself. Breath of the Wild! This was a replay but I hadn't touched the game since the DLC came out so I feel like this counts as 'Year of the Backlog'. Playing the game from beginning to end a second time is amazing. I'll never get to play BotW for the first time again but heading out into the wilderness knowing a LOT more about how the games mechanics play together made for a very enjoyable experience. I haven't touched all of the DLC but I have to say that Nintendo put a LOT of care and thought into the content, especially the parts focused on the Champions. The BotW Champions are all amazing characters that deserve to have their own game but that's probably never going to happen. Injustice: Gods Among Us is a great fighter. I originally played it on WiiU but I got it digitally for PS4 during a promotion that tied into Injustice 2 last year. This version has all of the DLC and content, including a lot that never hit WiiU. It's actually really natural and intuitive going from Injustice 2 back to Injustice 1. Even though the cast is very different, the mechanics and gimmicks align closely enough that it is easy to replay the first game and gain an appreciation for the evolution that that went into the second. 1 thing I do like about the original is that the cast of characters is much more focused than the follow-up and I appreciate that. Injustice 2's fan-service game is strong but it also creates a cast that has a weird feel to it, more akin to a Capcom Vs SNK type cross-over title than a follow-up within a single franchise. Dungeon Hack is quite possibly the ultimate dungeon crawler approach to Advanced Dungeons & Dragons. It features a setup similar to Eye of the Beholder, but with a few quality of life improvements like an easily accessible map and "radar" feature. 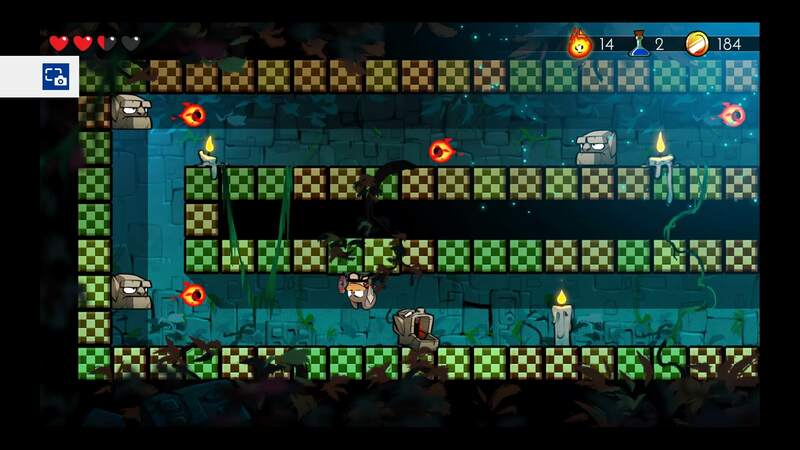 It offers billions of potential dungeon designs, with an array of traps, layouts, hidden doors, teleporters, spinners, monsters, and of course treasure. It also has some nasty designs thrown in for good measure, such as the potential for an entire level underwater, sections of dungeon that are pitch black, and "boss" monsters on various floors which may well require gear you simply do not have. 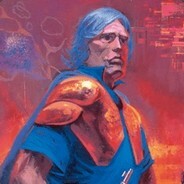 Factor in the ability to play it as a roguelike with permadeath if you so desire, and the ability to set whatever options you want in the dungeon (such as turning on pits, making monsters tougher or easier, removing the underwater level, etc. 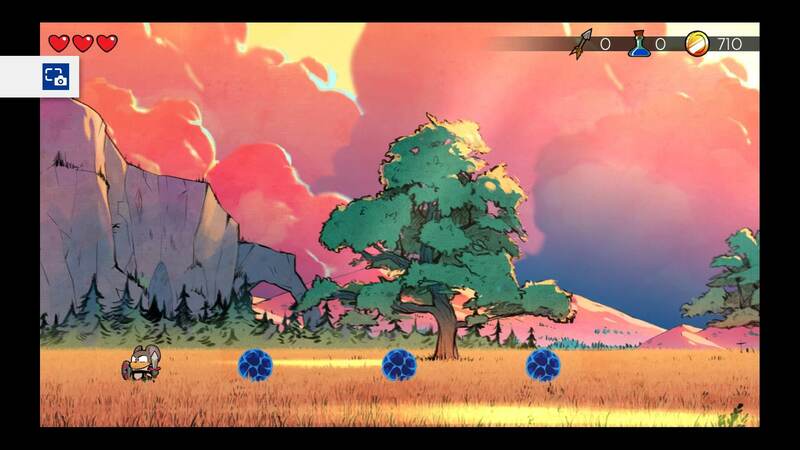 ), and you have a lot of potential gameplay however you want to approach it. Unfortunately, Dungeon Hack also highlights some of the problems with AD&D video games, such as required class abilities necessary to progress in case you don't get lucky with gear (and you might but probably won't) and the ever problematic starvation system. The game acts as a race against the clock, as you try to delve through however many floors you can manage before running out of rations...or you come as a Cleric and get to level 5 so you can cast a spell which completely negates the need for food. You might also not have the gear necessary to get through the underwater level, which means a slow death from drowning...or you come as a Cleric with the Water Breathing spell. Healing takes forever...or you come as a Cleric. And guess who gets a spell to see invisible monsters? Mages do. 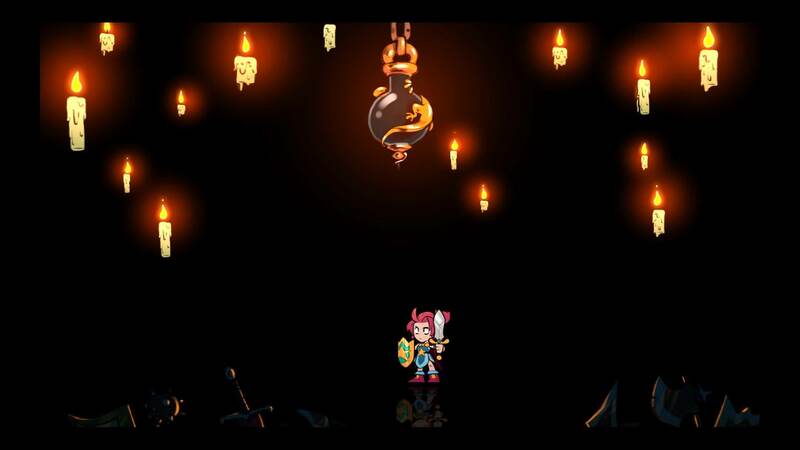 Mages can also get the spell to turn invisible, which causes most enemies to be unable to hit you. But Mages and Clerics aren't frontline fighters and tend to be squishier, which is why you want a Fighter who can take the brunt of attacks. Do you see where I'm going with this? Each of the core classes from Dungeons and Dragons fills a key role and offers much needed abilities to help deal with whatever threat or challenge you're facing. But Dungeon Hack only lets you play as a single character, so what's the solution? Either play a Cleric and hope for the best or cross-class like a mother, which is what I did. Only Half-Elf characters can reach the holy trinity of Fighter/Cleric/Mage, which is absolutely ridiculous and what I ended up doing. It took a long time to level, but by the end of the game I was untouchable. This happens when you buff yourself with Protection from Evil, Bless, Aid, Prayer, Magical Vestment, Shield, Detect Magic, See Invisibility, and Improved Invisibility while also sporting a -10 AC and a morning star that was at least +3. The dungeon can also drag on too long. I read in reviews of Dungeon Hack that a dungeon of about 12-13 levels was the ideal, and having just run one with 18 levels, I agree. Level 12 was the last floor where I had a problem; by then, I'd seen nearly every monster in the rotation and had the weapons, armor, and spells to breeze through the next five. I was so leveled up that by the time I got to the final boss, some nasty critter that looked like a demon (it may have been a Balor), it couldn't touch me. 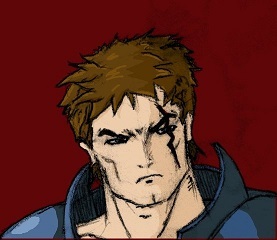 I sat back and slowly beat it to death with my morning star while watching to see if it would ever actually damage me. It didn't, and I beat the game. Hey, I planned ahead knowing what AD&D could be like and having the experience of having best two Eye of the Beholder games ahead of time, so I did know what to expect. Even with an idea of tactics and gameplay, I still found certain areas and monsters challenging, so don't think that Dungeon Hack is a cakewalk. It isn't. Plan ahead. It does offer a lot of variety, and it's a game you can go back to again and again regardless of whether you win or lose. I recommend it to dungeon crawler fans. But know that you're going to experience some of the same problems as EotB, and some of those issues will be magnified due to the party of 1. I don't think I'd ever attempt this while not playing either a Cleric or something cross-classed into one, because Clerics are simply too important to pass up. 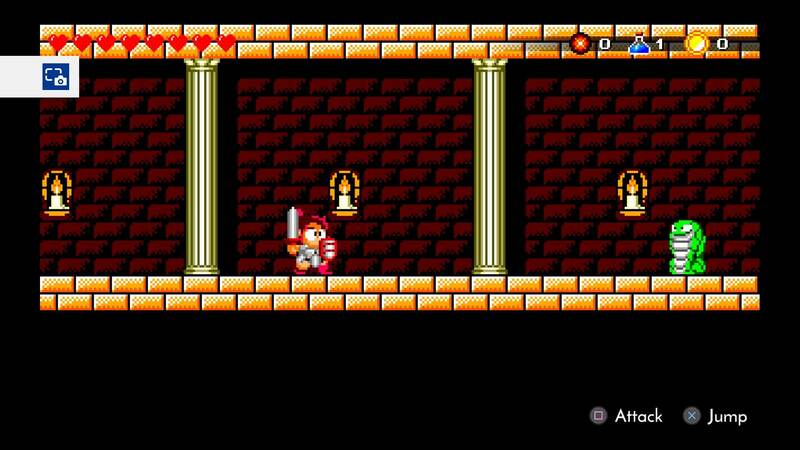 Though it's kind of a Metroidvania, you don't really get upgrades past initially unlocking the ability to store items. 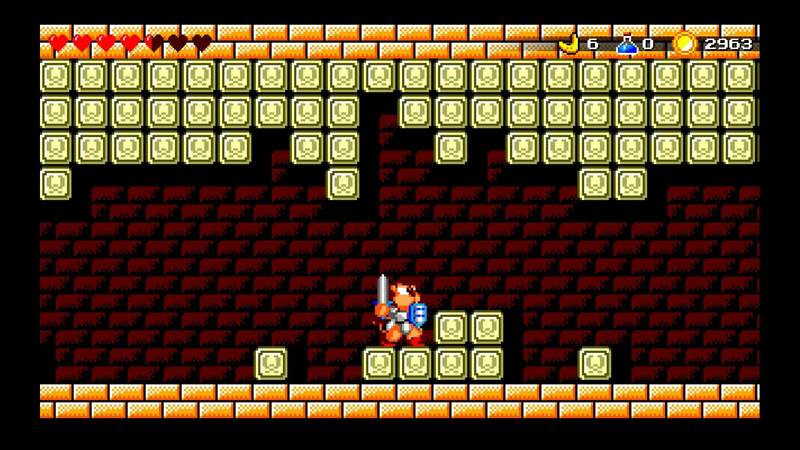 Instead it's more when you unlock certain items and how you unlock different areas to get money from. The actual gameplay is a little bit like Mario 2 (you can pick plants up out of the ground to get items from them and throw them at stuff) but is far more Lyle in Cube Sector as far as the larger gameplay mechanics and artistic aesthetic goes. Your goal is to find one of each animal around the world and take them back to your safe room. The safe room is where you spawn and respawn and is also where you send items back to because that room never changes while all other areas reset when you die. Slowly finding more keys to unlock doors to new areas is fun, and there's even a small puzzle that unlocks you a kind of second ending, but it took me maybe 2 more whole minutes than beating the normal game, so it's not terribly labor intensive and can easily be done just hopping back in once you complete the animal collection. My speed for adding games to this list is slowing down as I am spending a lot of time in Skyrim VR, but I did notch a few others in the past couple days and hope to spin out some shorter games on the side here as I continue to trudge around Tamriel. Orcs & Elves I beat for Together Retro and it is a fun little First Person Dungeon Crawler that eliminates many of the frustrations found elsewhere in the genre. It runs on the Doom engine and was made by John Carmack and his wife Katherine King. I am only echoing the sentiment of a lot of other folks here when I say it is well worth checking out. It was the first DS game I have beaten since 2015. I beat Tekken 7 in Arcade mode with no continues, which is not much of an accomplishment, really. Tekken 7 seems fine, but at this point I vastly prefer the Tag Tournament entries in this series over the main games. These reviews need to be spoilered for size, as this post was way too big by default. Please click them and read them and let me know your thoughts! 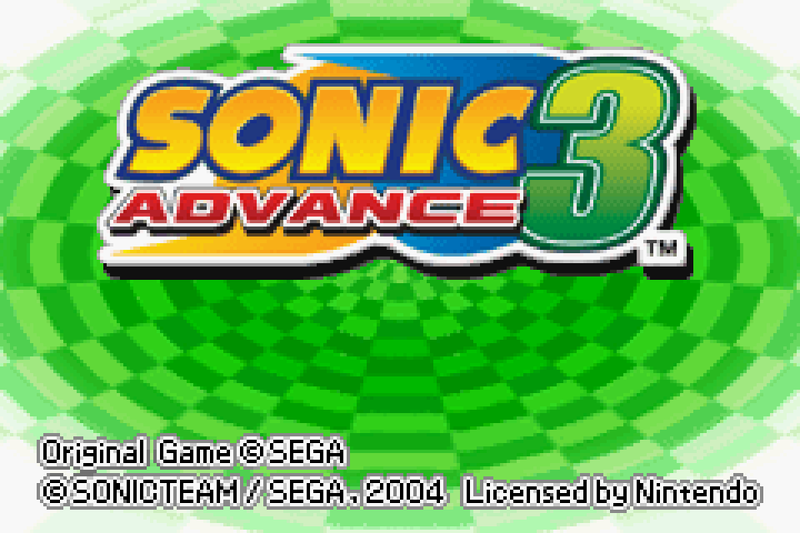 Sonic Advance 3 is the third new sonic title released onto the Game Boy Advance (obviously). 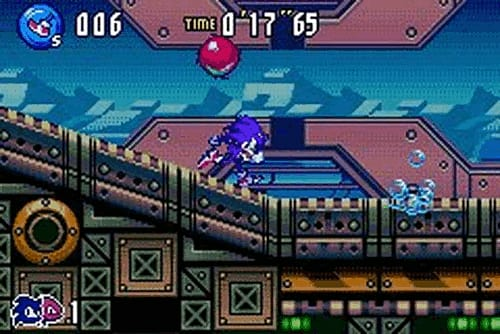 Like the other 2 games in the series, Sonic Advance features a bunch of new levels to run through as several Sonic characters – in this case Sonic, Tails, Amy, Knuckles and Cream are available. However, unlike the previous games, and obviously inspired by it’s contemporary console counterpart Sonic Heroes, Sonic Advance 3 allows you to select 2 of the 5 heroes to play as a team. 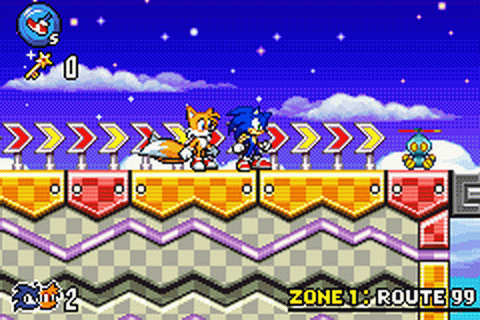 Alongside your main character you can choose a buddy who can provide support actions by holding R. These vary by character, and they can be useful on occasion , but in reality they don’t change a whole lot, at least from the little I saw – as the only characters available from the start are Sonic and Tails, I only got to see the basic speed boost move which acts like a quicker spin dash. The level design in the game also seems more inspired by the console games of the era, from Sonic Adventure onwards, as it features more urban feeling environments alongside the usual green hills, water, factory levels of the rest of the series. In fact, the very first stage is ‘Route 99’ which is a highway stage with lots of vertical running reminiscent of the likes of Speed Highway and Radical Highway from the Adventure games. The game seems more fairly balanced compared to Sonic Advance 2, with less bottomless pits and slightly fairer enemy placement, but it still feels cheaper than most of the Mega Drive games (which weren’t always flawless in this regards, but performed better overall). 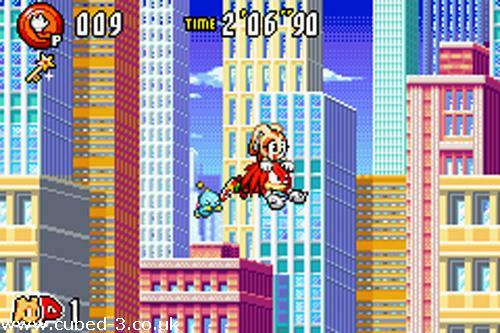 Like the other Sonic Advance games there’s also a bunch of superfluous stuff added which seems to aim to replicate the console experience but which is entirely unnecessary – like being able to attack with the B button. 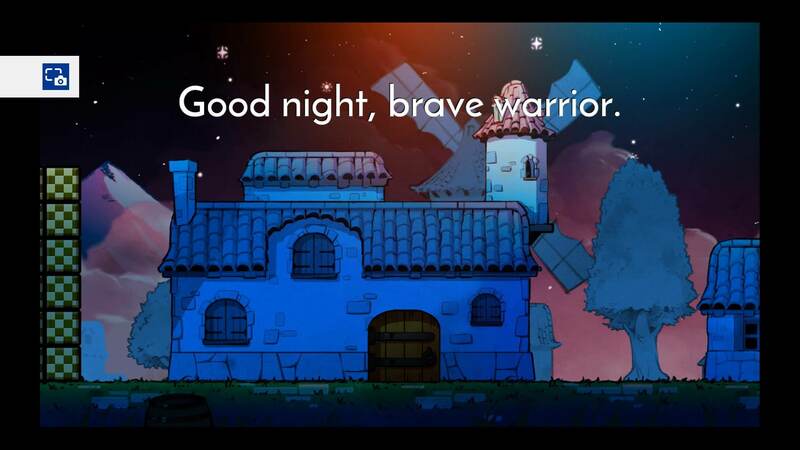 The game is fairly brief, but in some respects I still felt like a single playthrough outstayed it’s welcome a little. This was mostly exacerbated by the fairly lengthy stages consisting of 3 full length acts each, making the pace of progression feeling slow compared to the nippy 2 act structure of Sonic 2 for example. Unlocking the final level is awful too – each Zone has 10 chaos hidden across the 3 acts that must be found to unlock the chaos emerald stage – if boring exploration in a sonic game is your jam, then have it! Graphically the game is a decent looking title for the system, but I wouldn’t say I ever felt wowed. The music is bouncy and fun, but I thought it sounded like it was struggling against the GBA sound quality rather than working with it – it sounds like it was composed without really considering the platform. Still, it’s all enjoyable enough, if a bit distorted. Overall, Sonic Advance 3 is a fun little romp for the handheld and a decent way to spend the afternoon. It’s far from perfect but it’s also not particularly offensive, and I had a good time. It’s pretty cheap, so if you like the series then definitely give it a go. 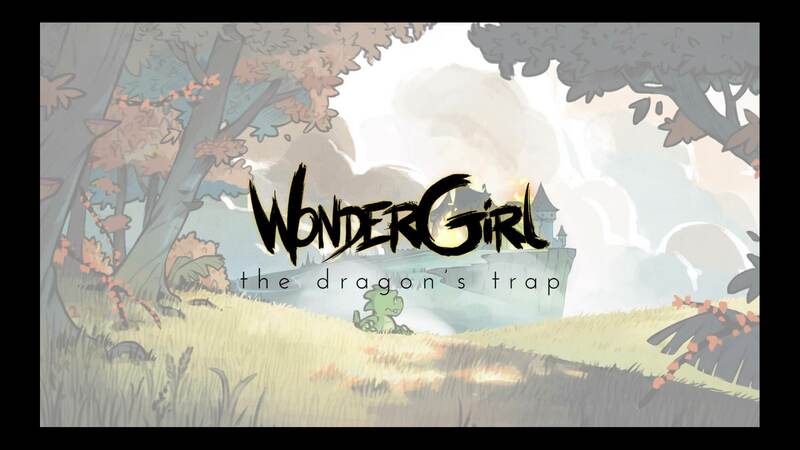 Wonder Boy: The Dragon’s Trap was a game I played back in March for Together Retro (yes, I’m pretty lazy and really far behind on writing these…). It required a bit of leeway to count as the theme was 80s games starring ladies, but I made it work – the original version of this game came out in 1989, but this PS4 remake includes the option to play as Wonder Girl instead of Wonder Boy). A quick note here: This review will mostly cover the changes between the versions, so I won’t really discuss the core game much. Just know that the original game is excellent, and so is this one. I played the original WB3 a fair few years back now and instantly fell in love it with it. 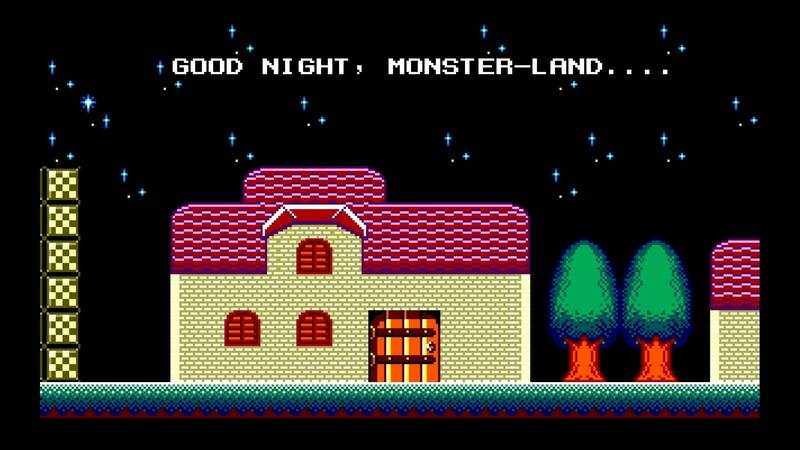 It’s probably the best entry in the series (though Monster World IV is excellent) and it’s definitely my vote for best game on the Master System. And so when I saw this remake I was a little apprehensive but excited – the devs really seemed to care about the original game and the new graphics style looked fantastic. My only concern was that they might make changes for the worse. Well I needn’t have been worried, because this game is amazing. 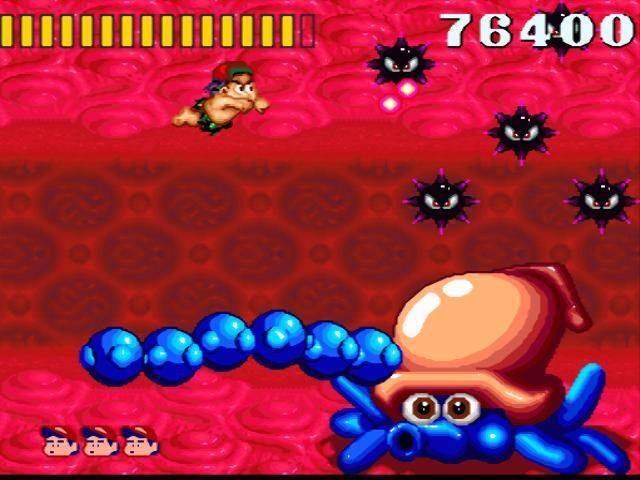 It feels and plays almost exactly like the original game, and you can even swap the new music for the old music or the new graphics for the old graphics in real-time during gameplay. You can also match to suit your tastes, with new graphics + original music being possible, or new music and original graphics. I played with all combinations, but for the most part I preferred new graphics and new music, with a few exceptions, which you’ll see in the required listening section below! There were a few small changes made to the core game, but in my opinion they do nothing but improve the game. The Magical Saber, a weapon that can create blocks, was swapped for the magical ring, which means you don’t need to switch weapons to use the ability. In addition, the original game’s ‘charm’ stat, a kinda tedious and obtuse system that restricted armour purchases if you weren’t cool enough, has been entirely removed. 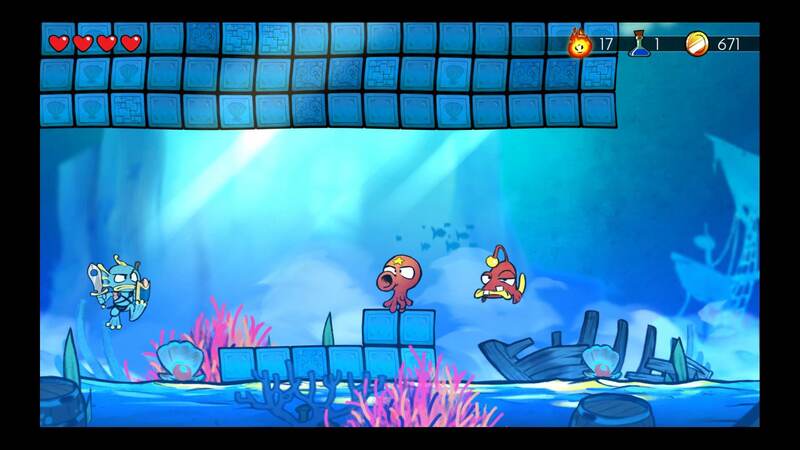 In it’s place are 6 new tough hidden areas, one for each of the animal forms, with a charm stone to be found at the end. These can be swapped for the new best sword in the game, which replaces the Magical Saber from the original. The new graphics of the game are stunning, with a beautiful watercolour look to them that really captures the games feel, and also the sense of nostalgia that playing it brings. The musical remixes are generally fantastic too, with each taking on elements of different music styles, my favourite being the tango remix in the required listening section below. Basically, this remake takes an already amazing game and gives it a nice polish into an even better one. I think it’s required playing for anyone who considered themselves a retro gaming fan, so pick it up on your system of choice and get going! And if you don’t have the new consoles, then the Master System or Turbografx versions are still great! As mentioned, the soundtrack to this game is excellent, but I do have one or two tracks where I like the original version more. Here's the best of the old and the best of the new, back-to-back. First off is the best song from the original game - side-crawlers dance. The new version is nice and chill, but I just love the happy vibes you get from the original PSG version so much more. Secondly, I love this tango-ised remix of the forest area (it's used in several other spots too!) theme. Best song in the new version in my opinion, check it out by clicking the image above - and stick around for the 33 second mark where it really kicks in! 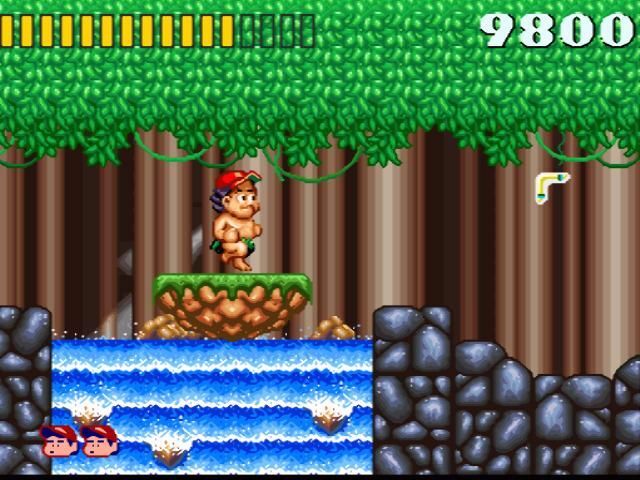 I hesitate to start on a negative, but I might as well get it out of the way – Super Adventure Island does remind me a lot of New Adventure Island, only worse in basically every way. 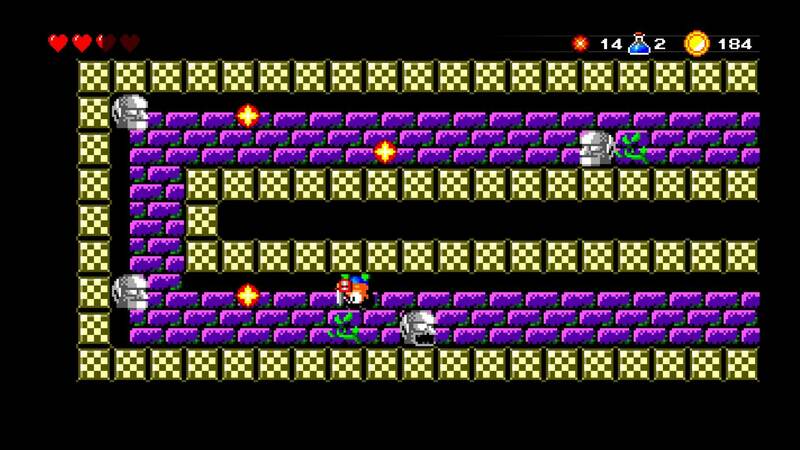 It’s shorter, easier, uglier and tries to compensate with limited continues, which is really annoying in a series full of surprise hazards and built around running straight ahead at full speed. 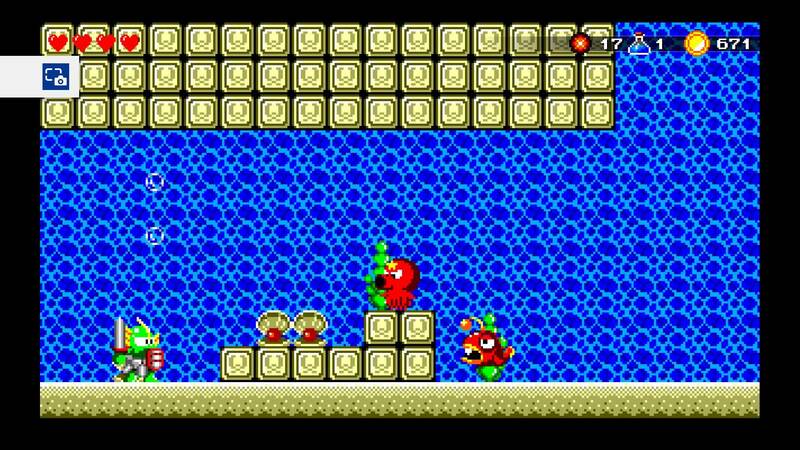 It feels like a B team effort compared to New Adventure Island, a game I loved and which made my top 10 favourite games in the year I played it. However, it’s not all bad. The gameplay present here is still fun. 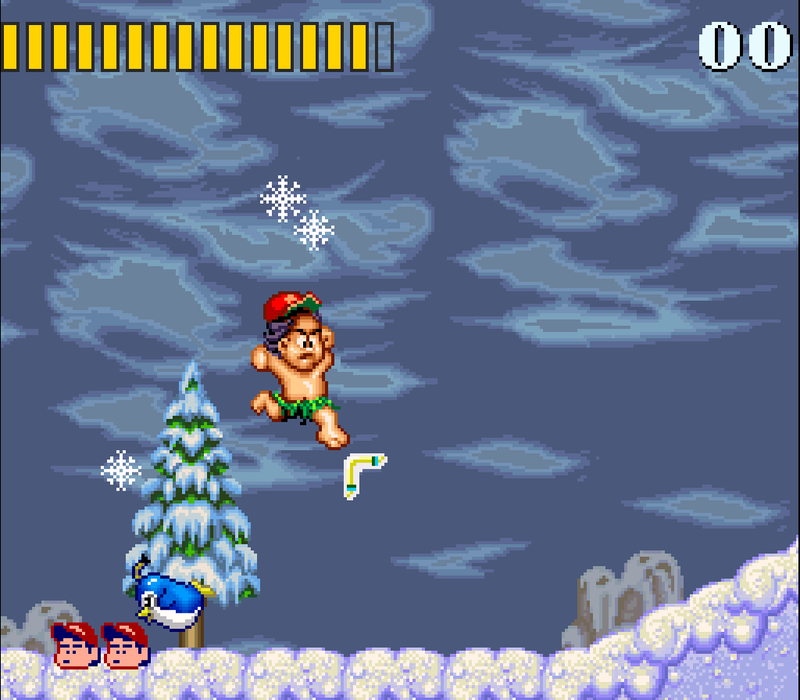 Higgins must run or swim from left to right avoiding enemies and grabbing fruit to refill his ever draining hunger meter. 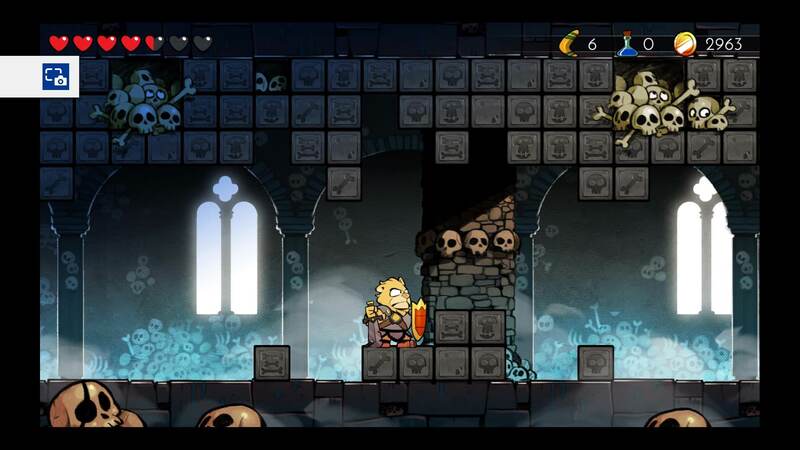 Higgins can find Axes or Boomerangs to throw at enemies, and grabbing 2 will power them up so they break rocks too. Boomerangs are generally better than axes due to superior ranges and accuracy, but in a few locations axes are the better choice, especially for a certain underwater boss fight. You can also find the classic skateboard, although it seems rarer in this game which is honestly fine as it’s mostly a liability anyway. 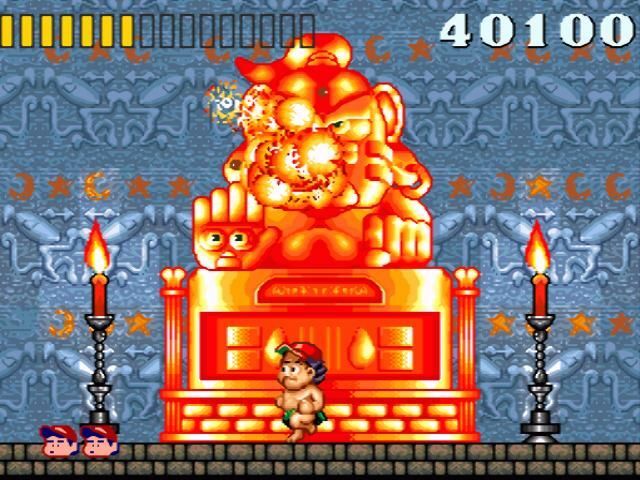 The game looks a little plain but still nice – it suffers from flat looking background due to very limited scrolling effects, and Higgins sprite is nicely drawn but honestly a bit too big – the size of the character and enemies leaves less time to react when a hazard scrolls onto the screen. The music in the game is nice, and apparently that’s because it’s written by one Yuzo Koshiro, who everyon knows is amazing. I wouldn’t put it up there with his best, but it’s still a solid playlist which features lots of music influences from the likes of dance, calypso, reggae, ska and electro, making for a very 90s sound which is kinda charming nowadays. 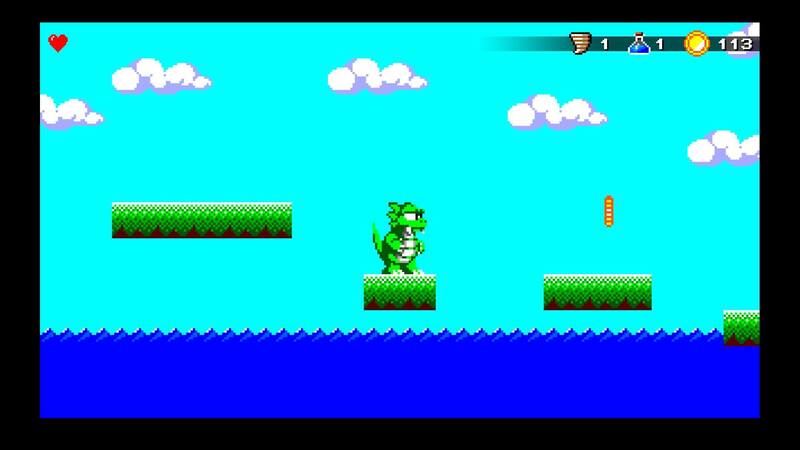 Super Adventure Island is in all honesty not that great, but it’s still a fun little game to play on occasion. It definitely feels a little rushed or low effort compared to prior entries in the series, but the core gameplay is solid enough to still offer something of worth. Give it a go if you find it cheap. A fun soundtrack for a fun enough game, it's certainly got some 90s charm - check those whistles straight out of the 90s Euro-club scene! 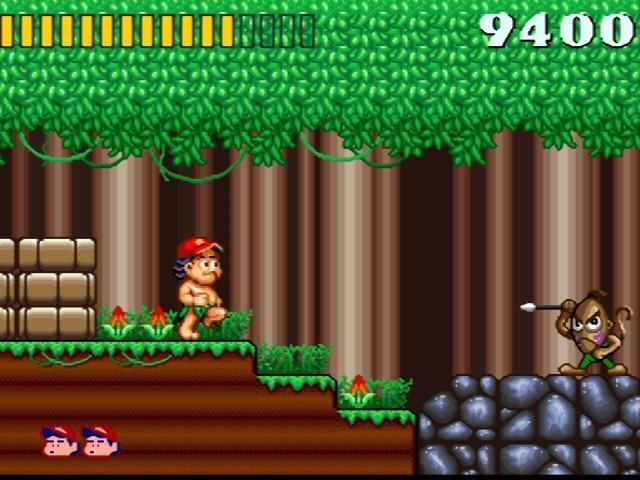 Wonder Boy and Adventure Island in one post! I’m glad someone else have some experience with these. I agree completely with assessment of Super Adventure Island, and IMO, it is more of a SNES tech demo than anything else. You must remember, however, it was actually released six months before New Adventure Island; so, rather than being a pale imitation, it is better to think of it as New Adventure Island’s vastly inferior predecessor. 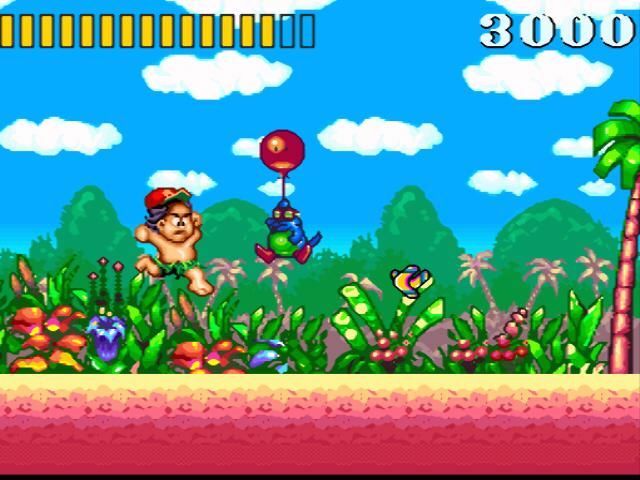 If you are interested in exploring the series a bit more, I recommend both of the Gameboy Adventure Island games and Super Adventure Island II, which is unlike the rest of the games in the series. I also heartily recommend emulating a translated version of Adventure a Island IV, which is also quite good. 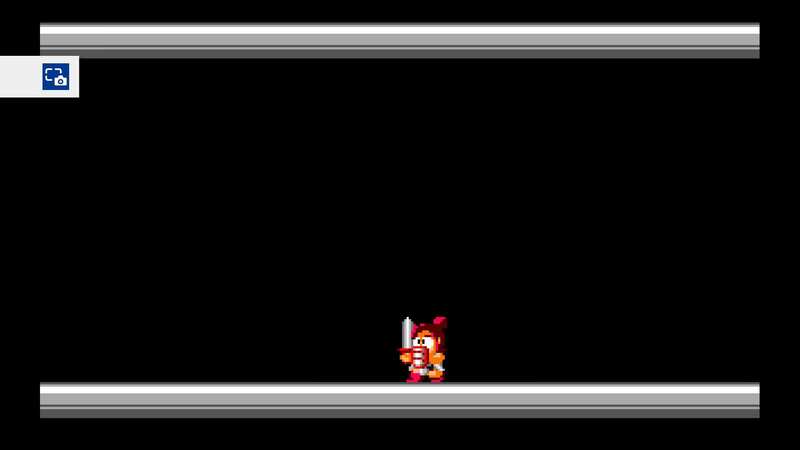 Avoid the other NES Adventure Island games, though. They’re just too hard. 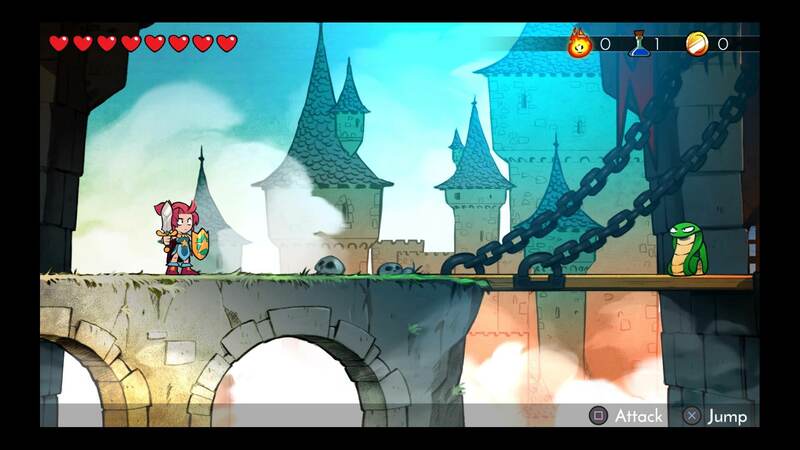 I’m looking forward to Wonder Boy III: The Dragon’s Trap. It will be the next game I jump on after I finish Shadow Tower. I picked up the Switch port of MWIII last week when it was on sale for $10 and so far (about a half an hour) am quite liking it. Is that the only game in the series to get this particular kind of remaster treatment? Yep. It's a great game; that coat of paint is absolutely beautiful. The gameplay held up really nicely, because under that pretty veneer, it's still (mostly) the same game. 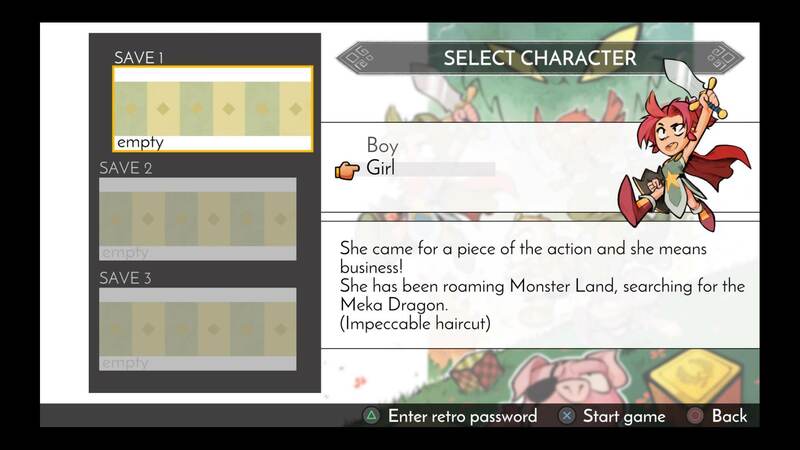 I'd love to see other games in the series with this sort of treatment; Monster World IV is legit. Couple of games beaten: Gotzendiener and Mighty Final Fight. 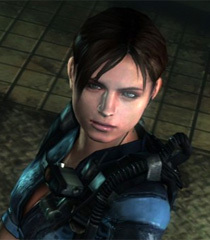 The former held so much promise, but is too short, too buggy, and too unfinished to be any sort of hidden gem. 4/10. The latter is still one of my favorite beat-'em-ups, and while I wasn't looking to get an early start on the June TR, I ended up blasting through with a splendid run that saw me hit max level with Haggar at the start of Level 4 (that's really quick, y'all), and also finish without continuing (and that wasn't very close, either). It's either an 8.5 or 9.0.